The Institution of Surveyors Victoria (ISV) is the professional body for the advancement and elevation of Surveying and Civil Engineering as professions in Victoria. The Surveying & Spatial Sciences Institute (SSSI) is the national body combining the professional disciplines of surveying, mapping, engineering & mining surveying, remote sensing & photogrammetry and spatial information. The Association of Consulting Surveyors Victoria (ACSV) represents the private sector of the land surveying profession in Victoria. The Urban Development Institute of Australia (Victoria) is an independent association of private enterprise organisations directly involved in the production, financing and marketing of all facets of property development. 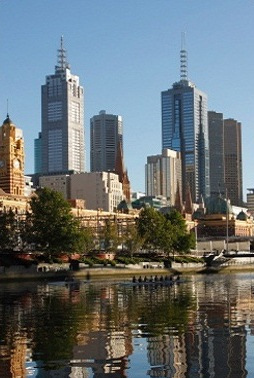 Their website provides information, news and events regarding urban development in Victoria. The Australian Property Institute’s primary role is to set and maintain the highest standards of professional practice, education, ethics and professional conduct for it members and the broader property profession. The Architects Registration Board of Victoria registers architects and approves architectural companies and partnerships, conducts inquiries into professional practice on behalf of the public. It also determines architectural qualifications and accredits courses and conducts examinations for registration of Architects. The Law Institute of Victoria (LIV) is the state's peak body for lawyers and those who work with them in the legal sector. The LIV supports people who work in the law, championing excellence and promoting the image of the profession in the community and provides a starting point for those interested in legal topics or a career in the law. Geomatics is the science and technology of three dimensional measurement, mapping and visualisation. The department does research and training (undergraduate and postgraduate) in the discipline of Geomatics. Geospatial Science at RMIT University is the largest academic group of its kind in Australia. They specialise in the training and education of geospatial scientists who work in a diverse range of professional areas across industry and government. Government information and services about land and property in Victoria. Quantity Surveyors are not qualified to perform land surveys. Typically a Quantity Surveyor (also known as a Construction Economist or Cost Manager) is one of a team of professional advisers to the construction industry. As advisers they estimate and monitor construction costs, from the feasibility stage of a project through to the completion of the construction period. After construction they may be involved with tax depreciation schedules, replacement cost estimation for insurance purposes and, if necessary, mediation and arbitration. The Victorian Building Authority is the regulator of the building, plumbing and, from July 2014, the architecture industries, providing domestic building consumer protection and ensures the safety, liveability and sustainability of the built environment. The Australian Institute of Building Surveyors (AIBS) is recognised nationally and internationally as the peak professional body representing Building Surveyors in Australia.